Over time, I found this combination of odds and ends, which is what you see above, to be my favorite: the green ends of leeks, winter squash innards (threads and seeds), kale stems. Other good add-ins are potato and sweet potato peels or bits, celery ends, carrots ends, onion ends and peels, parsnip ends, and mushroom, collard or chard stems. Mix and match the veggie scraps as you go. Cover them with water, bring to a boil, cover, turn heat to low, and let simmer covered for at least a couple of hours. Strain, use, or store in frig or even freeze it. This is the kind of process that actually improves with benign neglect, which means it’s perfect for me. I can leave it on for too long. I can use whatever I have on hand. I can play it by ear and not measure how many cups of water to how many cups of veggie scraps. It always comes out fine. Each time it tastes a little different, depending on which veggie scraps predominate. That’s why I like to have a leek green and a few kale stems and squash innards as a base, if I can. They all add a depth and sweetness to the broth. You can make an instant soup with this simply by heating some of it up and adding chard, carrots, parsnips, Brussels sprouts, or whatever suits your fancy, and let them simmer a few minutes until the veggies are just done. Pour it over any grain and/or beans you may have, or any little bit of leftover something (like chopped baked sweet potato or a bit of chili or red beans) and you have an impromptu bowl of soup. Nice for this time of year when I can see my own breath and it’s dark at 4:30. Or when those tenacious viral bugs are making their rounds. Or I just want something hot to help me get warm. This will do the trick. And it costs nothing more than the veggies I already buy, and a little time to simmer some healthy magic. The “blessing,” left over after making Creamy Potato Leek Soup from StaightUpFood. You’re welcome, D’Ann! Welcome to the Everything-But-the-Kitchen-Sink broth club! This is exactly how I make my stock. Whatever is left from the veggie trimmings. It’s delicious, sodium free, and virtually free. After I’m done I can compost the drained veggies. Very eco friendly. Yes, yes! I compost the drained veggies, too. You make it sound so easy! 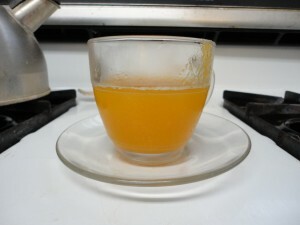 Especially with the idea of freezing broth ingredients as you go, brewing broth at your own convenience. I’m going to try it. Thanks, Maria! I love the way you think. Cooking doesn’t have to be one particular recipe. I think this way with ”old school” cooking. I just had an ahah moment with this post. Thank you so much!!! As always I enjoyed this post. On another note, I was at the hospital with my mom yesterday and the nurse told me her mom has MS. I told her your story in hopes she could benefit from a vegan lifestyle. Glad you had an ahah moment reading this post. And thanks so much for passing on my story to the nurse for her Mom. Healing blessings to both your Moms. This is exactly what I do! Save the veggie scraps in a 1-gallon freezer bag and them simmer them in the slow cooker for 6 or more hours. Commercially sold veggie broth is not available at all where we live. And if you compost, you can *still* use the scraps after they’ve been used to make the broth. I have been thinking I’d like to try it in my slow cooker, too, so thanks for the reminder. And yes, cooked scraps are as good for compost as raw ones. Thanks! This is a great idea when you need to clean out the fridge before going out of town! Definitely keeping this in mind – I hate throwing away produce!!! Me, too, Caity! It helps me feel like I’m getting the best use out of the money I pay for organic produce, too. I do this, too, and it always tastes so good! I love the idea of freezing them. Just never occurred to me before. I’ve always heard to use the scraps but by the time there are enough, they have started to rot. Thanks, Kathy. The timing without freezing used to trip me up, too. Yayyyyyy!! Thank you Maria, for bringing this “old school” & really valuable tip to our attention! Buying expensive boxes of veggie stock is CRAZY…use what we HAVE, that’s the very best, most fully conscious- way to go! I just love, love, love your blog and have gotten sooo many great ideas, recipes and motivation from it! I too, have been a Swank ms diet follower, for almost 24 years now! No meds whatsoever…thank you, for sharing your life and precious life experience with us all. Thanks for this enthusiastic comment about the broth and the blog. I am so honored that you are following along and enjoying it so much. I remember you from my time at the Swank board and know without a doubt you are an inspiration to many people there. Here’s to your next 24 years with absolutely no meds whatsoever. I’m going on 17 years, and counting. Hooray for both of us! What a wonderful tip; brilliant in it’s sheer simplicity! I think we all had the same thought reading this, “Why didn’t I think of that!” I’ve been making my broth from scraps (thanks to Mom) for years and never thought to freeze them. I am going to start several bags for different types of broth, too! And cooking the potato skins will keep them from sprouting in my vermicompost! Woo hoo! Thank you! You are very welcome! I so enjoyed your enthusiasm about this post, I gigled myself. It is so much FUN to realize something like this, isn’t it? Perhaps you’ll come back and post us about the different types of flavor combinations you decide to freeze for your broth. It just works really great for me, especially living by myself. Gives me time to accumulate enough for a big batch. 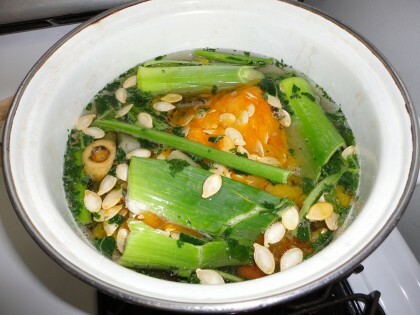 This is generally how I make my stock, but I never thought about using kale stems and squash innards! I am adding those to my repertoire immediately. My frozen stock reserves are dangerously low right now. Glad you like the suggestions, Mary Kate! This is a great idea. I usually compost scraps, which could still be composted after making broth. Ooooh I like that. Thanks, Ginger! Love your name. thank you for your soup, and all you share, somehow i just fel you are special and i love to visit your site! My granny did this for years. One day when I was still in grade school, I saw her putting scraps in a baggie and asked her what she was doing. Ever since then, I’ve done the same. Mine is usually mostly carrot peels and ends, celery leaves and bottoms and the dried up ends, and the outermost layer of onions along with the ends (I tend to toss the peels; they can cause a bitter taste if cooked too long). I always add a couple (or a lot!) whacked garlic cloves, a bay leaf and another onion quartered. I boil it all up in potato or pasta cooking water or lentil soaking water.